During the XVIIIth century the importance and reputation of the Order declined for various reasons. The Knights ceased to be seen as a bastion of Christianity against the Ottoman threat. The Knights' attacks on Ottoman ships were considered as acts of piracy, similar to those perpetrated by Barbary corsairs. Enlightenment philosophers led European public opinion to regard the Knights as noblemen who lived off hereditary privileges and did not make any contribution to the progress of society. The 1789 French Revolution and its developments were fatal to the Order. In June 1798 a French army landed on Malta and the Knights surrendered without any real attempt to defend their small state. This page is illustrated with coats of arms or heraldic symbols of the Grand Masters. One of the first events during the long government of Perellos was the visit of an envoy sent by Peter the Great, Tsar of Russia. Peter had just conquered the Ottoman fortress of Azov, on the sea by the same name and he had founded a Navy base at nearby Taganrog. The Russian envoy was sent to Malta with the objective of laying the ground for future alliances against the Ottomans. 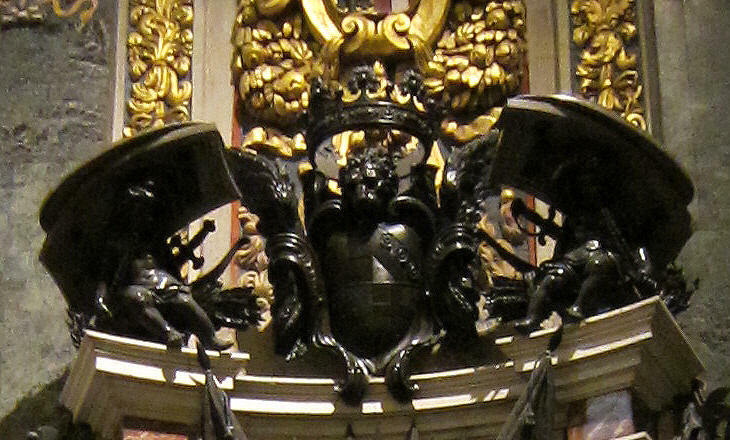 Perellos treated the envoy with much pomp, overlooking the fact that Russia was not a Roman Catholic country. The visit marked the beginning of a relationship which became so intense that in 1799 Russian Emperor Paul I became Grand Master of the Order. In 1715 the Ottomans waged war on Venice, but Perellos did not have the opportunity to intervene in the war, because the Venetians lost their fortresses in the Peloponnese in a matter of months. In the following year the Austrian Empire joined the Venetians, not so much to help them, but to enlarge its territories. The war ended in 1718 with the Peace of Passarowitz by which Austria made substantial gains in the Balkans, including Belgrade, a key fortress on the Danube. After these losses the Ottoman Empire was no longer able to sustain an aggressive policy in Europe. Perellos had a countryside residence at Zejtun where he promoted the construction of St. Catherine's, a large and elegant parish church. A detail of the statue of the saint which is carried in procession is the icon of this section. 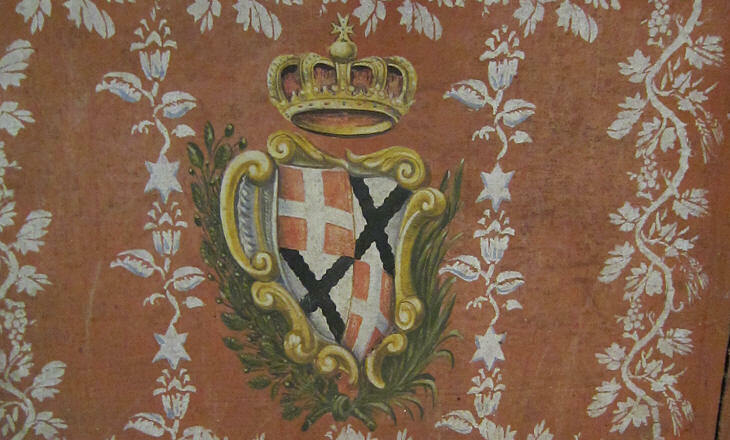 The surname Zondadari does not ring a bell outside Siena, but Chigi-Zondadari is a better clue to understand why the Knights chose Marcantonio Zondadari as their Grand Master. His mother was Agnese Chigi, niece of Pope Alexander VII Chigi and his brother Antonfelice was an influential cardinal at the time of Marcantonio's election. During his short government he became popular at Bormla by renaming the town Città Cospicua. He was buried in a very imposing marble and bronze monument by Massimiliano Soldani Benzi, a Tuscan sculptor and medallist. The monument was so big that it did not fit the Chapel of Italy and therefore it was placed in the main nave of St. John's Co-Cathedral. Pope Clement XI used to reply E' tutta beneficenza (it is all a charity) to those who criticized his pouring money into building fountains, erecting obelisks, restoring and redecorating churches. Grand Master Vilhena could have used the same words to justify Fort Manoel, a new fortress opposite Valletta, major bulwarks at Floriana, large palaces at Mdina/Città Vecchia and Rabat (today's Victoria). Vilhena placed military symbols (flags, guns, drums and swords) even on banks. 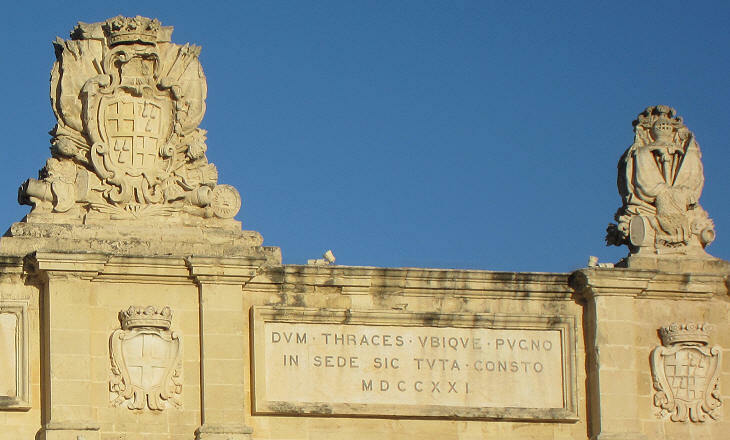 The lion holding his coat of arms near Victoria Gate in Valletta was portrayed as being very aggressive (you can see it in the background image of this page). Notwithstanding these stone references to war, Vilhena's government was marked by a de facto truce with the Ottoman Empire. 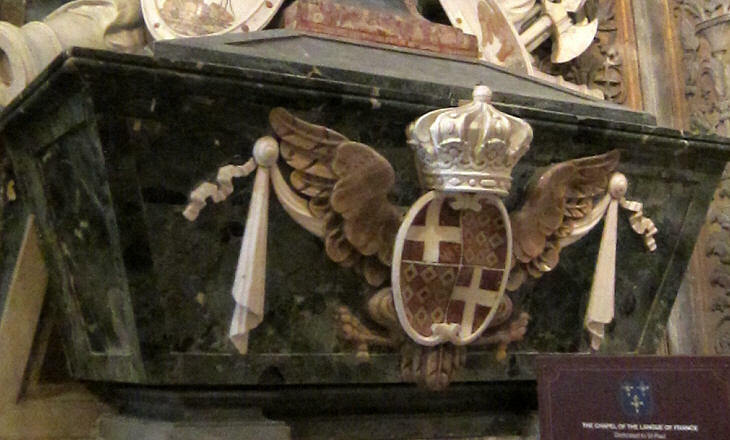 Probably because Vilhena had depleted the Treasury of the Order, Grand Master Despuig did not have the opportunity to leave his coat of arms on many monuments of Malta. It has to be said that during the short French occupation of the island (1798-1800) many coats of arms of the Grand Masters were erased. 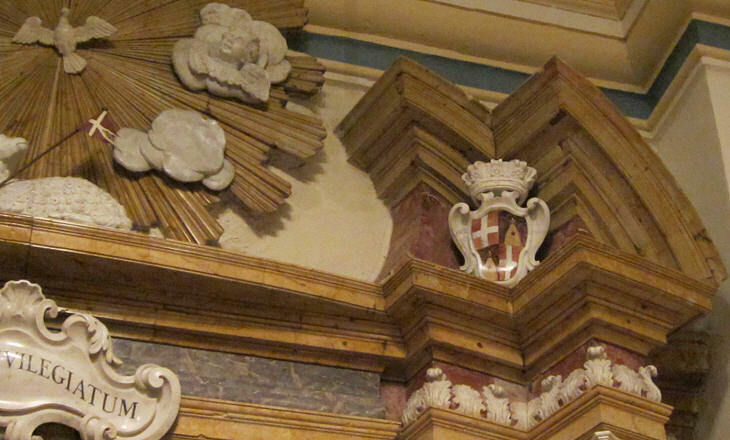 During the long British rule (1800-1964) instead, the heritage of the Grand Masters was held in high esteem and the coats of arms of the United Kingdom were placed side by side with those of the Grand Masters (see the Monument to Victory at Borgo/Città Vittoriosa). The long government of Grand Master Pinto was almost uneventful, exception made for an attempted revolt of the Muslim slaves of the island. Pinto established very good relations with France. The French had excellent relations with the Ottoman Empire and they favoured peaceful, if not amicable, relations between Malta and Constantinople. Because of the long truce with the Ottomans, the Knights lost their past bellicose attitude and military skills. The defence of the fortifications was entrusted to mercenaries; warships were superbly ornamented; enormous sails, striped with blue and white, carried on their middle a great cross of Malta. (..) Every thing concurred, when they were under sail, to render it a magnificent spectacle. but their construction was little adapted either for fighting, or for standing foul weather according to Charles Sigisbert Sonnini who visited Malta in 1777 on his way to Egypt. After the very long government of Pinto, the Knights wanted to make sure the next tenure would not be as long as Pinto's one. Francisco Ximenes de Texada, the new Grand Master, was aged seventy and in poor health. His government is remembered only for a failed revolt of some knights, probably instigated by Empress Catherine the Great of Russia, who was seeking a base in the Mediterranean for her navy (in 1770 a small Russian fleet defeated the Ottomans at Cesme). The de Rohan are one of the most illustrious families of France, but Grand Master de Rohan had a military/diplomatic career in Spain, Italy and Austria before joining the Order. The lazy and expensive life of the Knights was disrupted by the French Revolution. In September 1792 the Order was declared extinct in France and all its properties were confiscated including the Temple, the residence of the Knights in Paris. The building was turned into a prison where King Louis XVI and his wife and son spent their last days. The Republican government charged the Order with siding with the enemies of France because it allowed the English and Spanish fleets to recruit Maltese sailors. Rohan strengthened the links with Russia and this was seen as another hostile act by France. Ferdinand von Hompesch was the first German Grand Master. The Knights probably hoped for the protection of the Austrian Emperor, but a few months after Hompesch's election the Austrian Empire signed the Treaty of Campoformido by which the Venetian Ionian Islands including Corfu were assigned to France, thus extending the French influence in the Mediterranean. In 1797 the European revenues of the Order were reduced to one third of their amount before 1789. The Order was unable to pay for the vital supplies needed by the Maltese population. 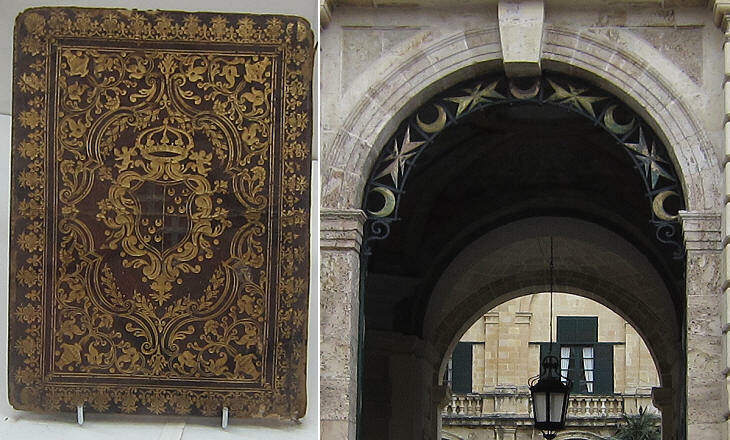 Notwithstanding these dramatic circumstances Hompesch built a triumphal arch at Zabbar. At the beginning of 1798 the French Directory approved a plan to conquer Egypt and assigned the task to Napoleon Bonaparte, a young general who had succesfully led a campaign in northern Italy in 1796-97. In early June Horatio Nelson, at the head of a small British fleet, was patrolling the Mediterranean to check Napoleon's moves, but he discovered too late that French ships were heading towards Malta. When some days later Nelson arrived in view of Valletta, he saw the French flag on Fort S. Elmo. He eventually learnt that Grand Master Hompesch had left Malta on board a merchant ship bound for Trieste after having renounced the sovereignty of the Order over the Maltese islands in favour of France. The departure of the Knights from Malta was very different from that which occurred at Rhodes in 1522 when the Knights were permitted to leave with the honours of war and carrying with them sacred images and relics. 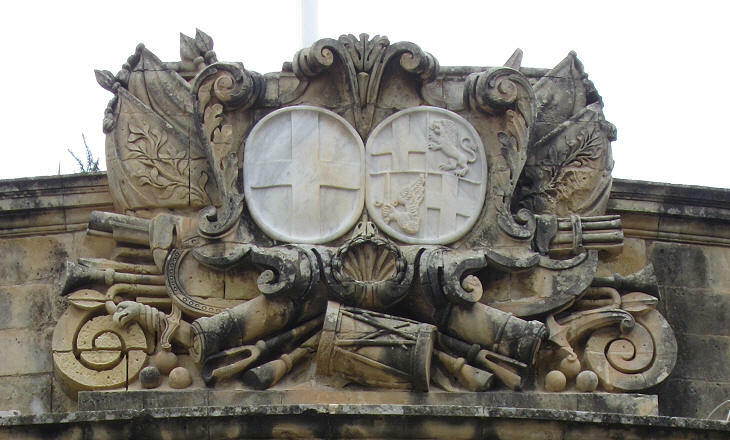 Note: in addition to guides and history books on Malta this page is based on The Achievements of the Knights of Malta by Alexander Sutherland which was published in 1830.